Even though it hasn't been printed, yet, I wanted to see how my new deck would work. I used my standard go-to, Aleister Crowley's Egyptian Tarot, as proxy. From that reading, I made a digital mock-up substituting my cards. The question I posed for this regarded the dream job I am manifesting. I have faith it's coming, but in what form, I don't know for certain. I am definitely open, though! Addressing the cards, I said, "Whether it's working for myself, for a college, in the government, or for a big company with all the cool things, tell me something about it." It's funny that my questions often are not in question form. It's more like a wondering. I shuffled and dealt these out. What I read as the "Influencer" card, in this case the Ten of Wands is called Oppression. Saturn in Sagittarius. Heavy and heavier. Dreadful. I know this card matches my subconscious attitude towards jobs. I also know that military veterans often have this attitude. That's why veterans have such high percentages of both entrepreneurs and homeless. That's why I have asked the Universe for the Perfect Job. 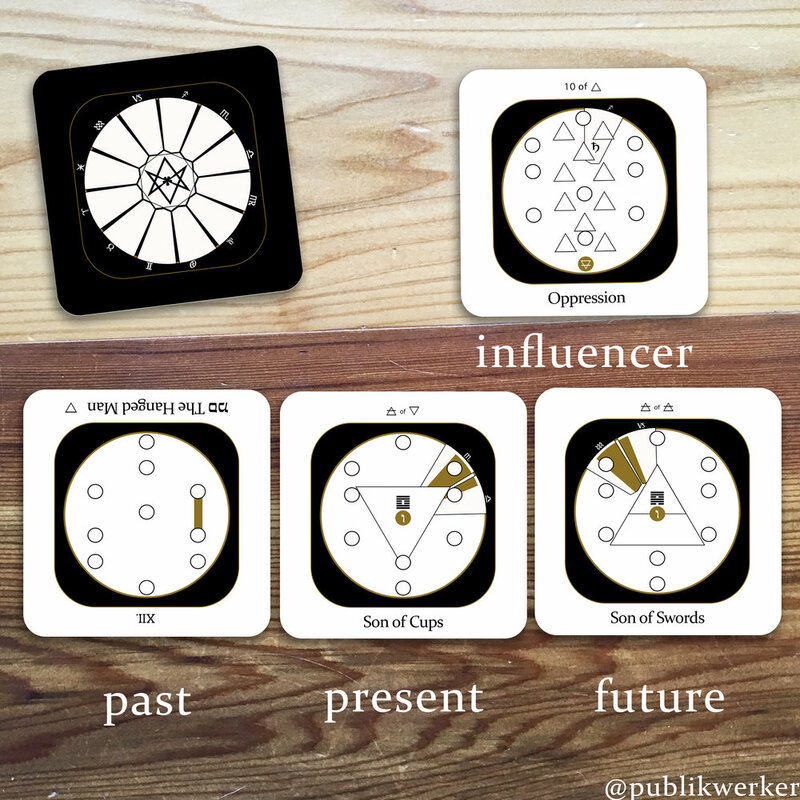 The center card, the Present, to me represents the Job, itself. The Prince of Cups, or Son of Cups, is the Airy part of Water: both completely free and capable of great work. That sums up what I'm looking for: productive, meaningful freedom. The card representing the Past, in this case the Hanged Man, also represents Water. It is the symbolic death through baptism and its association with sacrifice. Both are of the previous Aeon. The new God "demands aught in sacrifice." The card representing the Future, in this case the Prince of Swords, is purely intellectual. It is the Airy part of Air: the Intellectual Realm. From a quantum standpoint, this seems to suggest that anything is possible. This is how the reading would look using my Thelemite Tarot Deck. You can order a Thelemite Tarot deck on my main page. All sale proceeds will be used towards printing this deck. Likewise, all sales of drawings, prints, and stickers also will be used to print this limited edition deck. They are gonna look so cool!